Investors flock to Bakkafrost as it goes public on Oslo Børs. 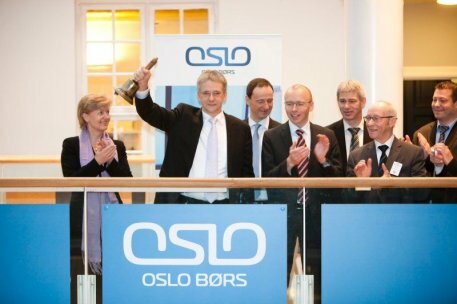 On the 26th of March in 2010, the biggest salmon producer in the Faroe Islands, Bakkafrost, was listed on the Oslo stock exchange (Oslo Børs). This made Bakkafrost the first Faroese company on the Oslo stock exchange and the first company from the Faroese aquaculture or fishing industry to go public. The initial public offering was more than seven times oversubscribed. CEO and President of Bakkafrost, Regin Jacobsen, comments: "We are pleased with the reception Bakkafrost has had in the market these last weeks. The company clearly proved attractive to investors, and we are very grateful for their support." The Faroe Fish Farmers Association is very pleased with the success of Bakkafrost’s listing, as it reflects both domestic and foreign confidence in the quality and sustainability of the Faroese aquaculture industry. Bakkafrost’s initial public offering was at NOK 31 per share and closed yesterday (28/06/10) at NOK 36.5 per share, an increase of 17 percent.